PARKING: From route 101 in Wilton turn left onto Temple Road. At 1.2 miles you'll reach the Temple town line and the road name changes to General Miller Highway. Continue 0.25 miles to the Souhegan River Flood Control Site 25B and gravel parking area on the left side of the road. From parking at the Souhegan River Flood Control Site hop the gate and head in a easterly direction across the open fields. Follow the perimeter of the pond past the dam and across the large field reaching the woods boundary at 0.4 miles. Skirt the perimeter of the marshy area through a forest of Mountain Laurel mixed with ferns reaching open woods after approximately 0.1 miles. Continue south following the path of least resistance to the highest point in Wilton at GPS coordinates N42 48.762, W71 48.972. The town highpoint is along the northeast slope of Fisk hill and is not marked or easily identifiable. The rock wall appears to be the town boundary and I followed it a few hundred feet looking for some sort of witness mark however found nothing. The woods get thicker as you continue southwest crossing several overgrown skidder paths to the summit. The summit is a round dome approximately 200 feet in diameter that is filled with small pine trees and thorny blackberry bushes. The highest point is not easily identified and not marked. After circling the area a few times the closest summit reference I found was a 18" diameter tree stump with a small stone cairn on top. 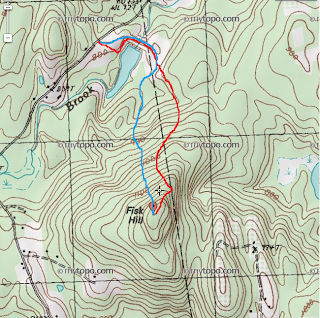 Parking at the Souhegan Watershed area isn't the shortest route to the Fisk Hill summit however the longer hike avoids any private property concerns and takes you through an interesting watershed area known as the General James Miller Dam. There is a plaque monument at coordinates N42 49.293, W71 49.240 which provides statistics on the 3450 acre drainage area capable of storing almost 200,000 cubic yards of flood. It was built under the Watershed Protection Act and Flood Prevention act in 1971. It certainly felt like, if the Souhegan River were to ever flood Wilton would be one of the safest towns in the area. 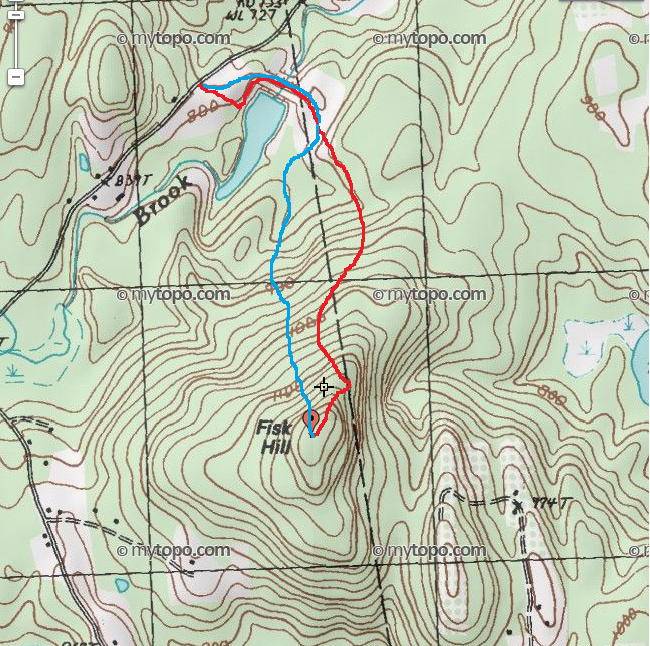 Both the Wilton highpoint and Fisk Hill summit weren't obvious locations and I was hoping for some sort of flagging or paint swatch marking each location. I was disappointed after finding nothing and needed to double check my mapping skills to confirm I had plotted an accurate location.